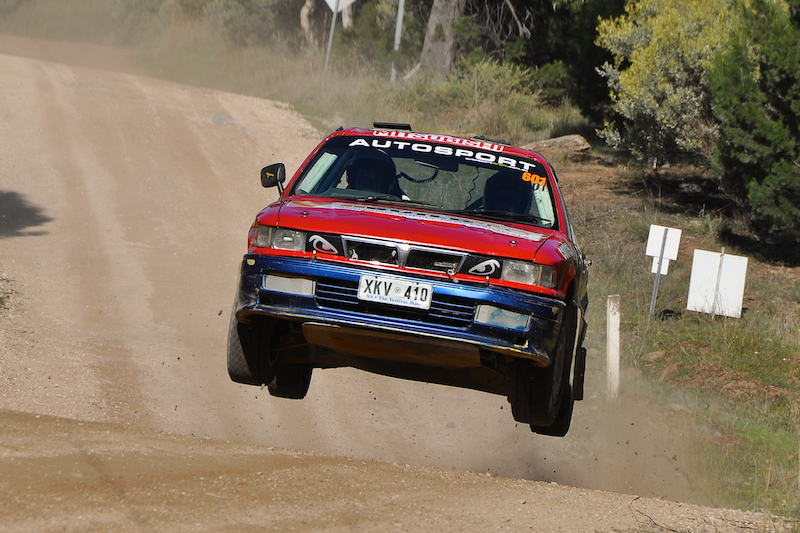 This was pretty much going to be just a post with a few links to maps and the spectator guide for this weekend’s Rally of South Australia, round three of the South Australian Rally Championship and round four of the Australian Rally Championship. But that would have been pretty boring, right? Luckily Henry Nott and the NOTTRacing crew stepped up and invited Any Given Reason to their Wednesday test day, so I strapped in for a sideways blast down the muddy test stage in Henry’s seriously quick little Lancer Evo 6. But more on that in a moment. Rally is arguably one of the hardest forms of motorsport to take photos of because you can’t just simply rock up and start shooting. Before you even get to thinking about camera gear and knowing how to use it, you need to be in the right place at the right time. And with literally hundreds of competitive kilometers stretching the entire Adelaide Hills over just three days, you can’t be everywhere at once. Eli Evans and Glen Weston have made Australian rally history by winning the 2013 Scouts Rally SA, leading the event from start to finish in their Honda Jazz G2. This win makes 9 consecutive wins from 9 consecutive starts, equaling the record set by the great Possum Bourne during his period of dominance in the late 90’s and early 2000’s. In a strong showing for the new factory supported Renault Sport team, Scott Pedder and Dale Moscatt claimed second place driving their freshly built Renault Sport Clio R3. The experienced crew of Brendan Reeves and Rhiannon Smyth finished third in another strong showing behind the wheel of the Rally School G2 Mazda 2. Jack Monkhouse and John Allen were fighting hard for their place on the podium until a broken water pump ended their efforts on Saturday afternoon. They fixed the car and rejoined, but were unable to place highly. They certainly entertained the spectators with long slides and big jumps wherever they went. Neal Bates and Coral Taylor once again won the ARC Classics class in their brilliant RA40 Toyota Celica. Bates is a seriously good steerer and this RA40 is like no Celica you’ve ever seen before so it’s not hard to explain their consistent wins. Some of their stage times are actually up there with the leading 2WD ARC cars! The fight for the remaining two podium places was hot, and in the end it was the local crew of Neville Whittenbury and Dave Rudham who just edged out their competition to claim second. The battle would have been even tighter had Barry Lowe not rolled his thundering Commodore on the second stage of Saturday in the Mt Crawford Forrest stage. Do it once, do it properly. This simple combination of six words is often thrown about nonchalantly when choosing a path to take and implies that whilst the easiest and cheapest route may seem attractive at first, in the long run it is always better to do something properly the first time, and need never do it again. Do it once, do it properly has quality at its core, be it the parts selected or the time and energy invested into the physical work. Cars, especially competition vehicles, that are built with this ethos are usually quite special; their owners’ pursuit of perfection often produces a result much greater than the sum of its parts, no matter how special those parts may be. And so it is with Michael Busby’s Series 5 FC3S Mazda RX7 gravel rally car. Before my ride I knew it was a special car with some special parts, and it certainly felt that way as we whined, burbled and brapped our way through the quiet Sunday afternoon backstreets heading away from Busby’s workshop. Eli Evans and Glen Weston have maintained their dominance in the 2WD Australian Rally Championship to claim victory at Scouts Rally SA in their G2 spec Honda Jazz. Despite a strong push from local hero Jack Monkhouse, Evans held on to extend his lead in the 2WD national championship. The experienced husband and wife pairing of Simon and Sue Evans cruised to second place in the debut outing for the new Rallyschool Mazda 2. The car showed exceptional pace throughout the event and was a serious challenger to the Jazz of Simon’s brother, Eli. This really is a remarkable effort because despite its looks, the Mazda isn’t actually a factory backed car – it was developed and built by Mick Ryan and the privateer team at Rallyschool. For it to be up challenging for an outright win in its first event speaks volumes of the thought and skill that went into its preparation. Classic rallying in Australia is becoming more and more popular, especially with the addition of a national classic championship that now forms part of the ARC. Rally fans, both old and young, are channelling their heroes and building up the cars of their dreams like never before. Why the sudden explosion of popularity? Well, to be brutally honest – modern rally cars are a little boring, a little sanitised. Even lower spec cars are so competent these days that they aren’t as much fun to drive as they used to be, and certainly aren’t as spectacular to watch. Going fast is all a little too easy. And when it does go wrong, you’re travelling that much faster and you’re that much more committed that it really hurts. Australian Chris Atkinson has won the International Rally of Queensland, Round 3 of the FIA Asia Pacific Rally Championship held in Queensland’s Sunshine Coast hinterland from 25-27 May. In a stunning drive behind the wheel of his Team MRF Skoda Fabia S2000, Atkinson and Belgian co-driver Stephane Prevot finished some 3 minutes and 57 seconds ahead of their nearest rival Alistar McRae. In the process Atkinson took out the Pacific Cup, and extended his lead in the overall Asia Pacific Championship. McRae and co-driver Bill Hayes drove a fine event in their Proton Satria Neo S2000. Whilst they simply couldn’t match the pace of Atkinson, McRae never put a foot wrong throughout the three day event and drove around a misfiring problem to hold on to second place. The final place on the APRC podium was taken by Kiwi’s Brian Green and Fleur Pederson driving a Lancer Evo IX.